From the minute one arrives in the town of Dar es Salaam, the feel of the Big Mountain is at hand. Mt. Kilimanjaro! Cruise ships dock at different berths in the harbor. The port has no dedicated terminal for cruise vessels yet. Dar es Salaam sits on the Indian Ocean on the east coast of Tanzania. It is the country's largest city and former capital and from here you can get a train inland to Arusha in the north, to Lakes Tanganyika and Victoria, and to Zambia for whom the port operates as an outlet for its copper exports. While you are here you can visit the Kariakoo market, the Botanical Gardens, National Central Library and the National Museum of Tanzania which has notable collections dealing with east African archeology and history. Dar es Salaam (which means "haven of peace" in Arabic) was founded in the 1860s as a summer residence for the sultan of Zanzibar. It was developed by German colonists and became the capital of German East Africa in 1896. 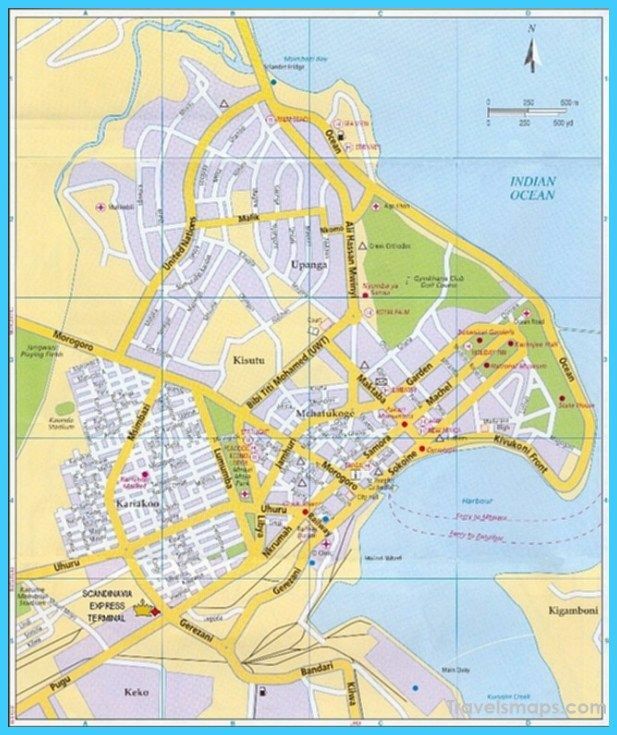 The city fell to British control in 1916 but it became the capital of a newly independent Tanganyika in 1961 and when Tanganyika and Zanzibar were merged to form Tanzania in 1964. In 1974, Dodoma was designated the new capital of Tanzania. The Zoological Gardens, the National Museum, the Village Museum. Walking around central Dar is a nice way to see the city and probably the best way to get around. In general, people will leave you alone except for the occasional greeting. There aren't many sidewalks in Dar so exercise caution when walking along busy roads. Kigamboni, or South Beach, is located across the channel from the Zanzibar ferry. Public beaches have been purchased by developers, so most of the beaches are maintained by hotels that charge an entry fee. South Beach Resort is a popular hotel on the beach, as are the resorts of Amani and Ras Kutani. There is a fantastic craft market in Mwenge, the Mwenge Carvers' Market. Here you can watch many of the artists make the crafts that are sold throughout the country (although some crafts sold in Tanzania are imported from Kenya). Prices range from expensive to extremely cheap. The market closes at dusk.